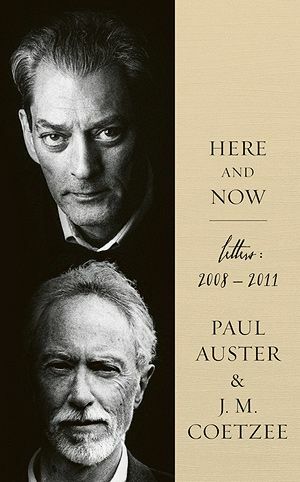 Paul Auster and J. M. Coetzee, two stalwarts of contemporary English literature, first met in 2008. Shortly after, Coetzee wrote suggesting they “could strike sparks off each other”. Here and Now is the result: epistolary correspondence from 2008 to 2011. They refer fondly to several meetings, but the majority is left for musing on bigger issues: philosophy, sport, old age. Coetzee rarely appears in public: his reputation is based solely on his books, most notably Disgrace. His ideas – on the recession, modern technology, his advancing years – come fully-formed and confident. Auster is often a few steps behind. His letters are littered with dropped names and references to his own work; self-congratulating to which Coetzee rarely responds or participates in. He tends to change the subject when he feels Auster cannot follow his own nuanced thinking. Auster is slightly younger and has an almost boyish reverence for Coetzee, adding an endearing warmth to his letters. Despite their lopsided exchanges, the two men share a mutual fondness. The trajectory of their friendship – the overarching theme of the book – is clear. Sparks have certainly been struck – in different ways for each writer.